Greetings! Andrew the Audio Scientist here, back with more advice for ACX producers. Today, I present the second part in my four-week video series, How to Succeed at Audiobook Production. Last week, I introduced The ACX Mile and covered best practices for the preparation and recording of your audiobook productions. This week, I’ll address editing your raw audiobook recordings. Before we get to the video below, I want to remind you of the key to producing reliably great sounding audiobooks: consistency. Establishing a routine you can return to time and again will set you up for success in the later stages of your productions and result in high quality final audio. Editing an audiobook can be as demanding a task as recording one, but optimizing your editing practices can greatly reduce the workload. Let’s watch part two of How to Succeed at Audiobook Production, and after, review the editing tips I suggest below. Audiobook editing is broken down into two phases: an audio editing stage, followed by a QC stage. Removal of extraneous and distracting noises from the audio. Modifying the pacing of the narration. Dividing the chapters into individual files, and preparing their heads and tails to ACX’s Audio Submission Requirements. Noting errors which may necessitate a re-record. Listening through the entire audiobook again to confirm the quality of the narration and the completion of the content. Creating a QC packet to organize all errors. Re-recording the phrases needing improvement and placing these new recordings into the edited audio. Mark your audio files – While recording narration, I recommend you place a marker at the beginning of each section or chapter of your audiobook in your DAW. This is helpful in verifying the completion of the recordings, and also gives an excellent point of reference to use in the QC stage of the editing process. While editing, place markers at all errors you’ve identified as requiring a re-record of the phrase/section in question. This makes the QC stage much easier. Click here for a sample QC sheet to help you note errors in your recording. Always use headphones – Editing spoken word audio requires a good pair of headphones. In last week’s post, I alluded to the fact that most audiobook productions only contain two sounds: your voice, and your recording space. Pesky clicks, chair squeaks, and other external noises are more easily heard in audiobooks because they have nowhere to hide. These sounds can limit the listener’s immersion into the story, and thus diminish the listening experience. Luckily, professional headphones are more affordable than ever before. Check out the entry on headphones in the ACX Studio Gear series for recommendations. Clean room tone is a must – Replacing gaps of silence with room tone is essential to a well-produced audiobook. Depending on your narration style and editing technique, you may also want to use room tone to modify the pacing of your read – an effective means of improving the clarity of your narration without needing to re-record the passage. However, if the room tone you’re using to perform this task contains noise of its own, then the entire editing process would be for naught. Be sure to listen back to your room tone at a high volume before editing it into your production to ensure it is sufficiently quiet. Don’t be afraid to crank the volume – Because you have not mastered your audiobook yet, the dynamic range of your recording may require you to ride the volume of your headphone output. This is OK! You want to ensure every portion of audio is clear enough to discern the clicks and extraneous noises that are contained within the recording. Mastering will bring up the volume of your recording substantially, including all sounds not caught during the edit stage. If they aren’t removed at this stage of the production process, those noises will present significant difficulties later on. Be mindful of your time – Experienced audiobook editors spend roughly three hours editing every hour of raw recorded audio. In addition, the QC process involves listening back to the entire book a second time. This equates to roughly 4 hours of work per hour of un-edited audio. If you are breezing through edits at a much quicker pace, then you may want to give your audio a second pass. Audiobooks are lengthy productions, so it’s in your production’s best interests to be thorough. On the other hand, if you find yourself obsessing with one issue, you may want to mark it and come back to it later. People have a tendency to be harder on themselves when they’re editing their own voice recordings, so it may be best to take a step back from the issue for a while and revisit it later. In any event, if you find yourself spending more than a minute on one issue with your audio, it may be best to simply re-record the line instead. 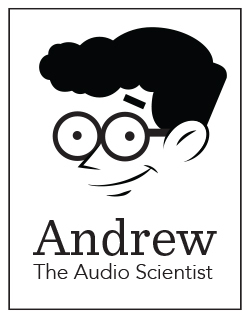 Read part 3, which covers audiobook mastering, here. This entry was posted in Actors + Studio Pros, Audio Scientist, Videos and tagged actor, ACX, acx mile, audio scientist, audiobook creation, Audiobook Creation Exchange, audiobook production, audiobooks, how to succeed at audiobook production, producer, production advice, studio. Bookmark the permalink. I have a big problem with the “mastering” section of this vlog. Mainly, because when I normalize, the volume does, yes, get cranked, but I’ve had titles sent back to me because of that… by ACX engineers. Andrew, thank you for all of the tips! I have a question about noise floor. I’ve isolated my machine, and made the room as quiet as possible, but my noise floor still seems too high. Is it possible that I have the gain turned up too high? Is it better to record at a higher volume and then eliminate the noise using a post processing technique, or a lower volume and raise it using a limiter or compressor? Should I record at a lower volume and then use a limiter to get the files into the -23db to -18db range? What are the dangers of doing that? Should I just get closer to the microphone when recording? Sorry for all of the questions – I’m new at all of this. Your noise floor will be relative to the overall gain level. If you raise your gain, the noise floor will be raised, and vice versa. Lowering the gain will eventually result in a higher noise floor, as after you record you will have to raise the overall volume to get your audio within the -18dB to -23dB RMS requirement. Using a limiter on a recording that’s very low in level could lead to issues such as “pumping” if not used correctly. Basically, lowering or raising the gain will not reduce the range between your voice and your room’s noise floor. Getting closer to the mic might help, but you increase the chance of recording more low frequencies caused by your proximity to the microphone, which would result in a bass heavy narration. It could also cause other issues such as plosives or even distortion. What’s the current level of your noise floor? It is close to being under -60dB RMS? If it’s only a few decibels away, you could use post processing like noise gating/reduction. You only want to lower the noise floor level, not remove it. Post-processing should never sound obvious; it should sound as natural as possible. If your noise floor is more than a few decibels above -60dB RMS, post processing might greatly reduce the quality of your audio. With noise reduction, it will sound like the audio is muffled or under water. With noise gating, there will be too great of a difference between the narration and noise floor and you will notice your noise floor whenever there is narration. To sum it up: If used correctly, you could fix your noise floor via post processing if you’re only a few decibels away from -60dB RMS. If you’re still a far ways away from -60dB, you should keep looking into ways of soundproofing your recording area. Post-processing software gets better every year, but it’s in no way a magical solve-all tool. Fixing and investing in issues like noise floor during setup and pre-production will save you so many potential headaches that can occur in post-production. One slight correction to this file. The tag at the end, “Read part 2, which covers audiobook mastering, here.” The link is correct but it should state “part 3”. This is an excellnet series for someone new like me starting out. Thanks so much! And I should have spelled “excellent” correctly. Gheesh what a jerk!